The cards are thicker than standard issue size. The card designs are very modern and feature color action shots of the player superimposed on a gray-scale background. The player profile is glossy sheen while the rest of the card front is in a matte finish. The die-cutouts give a sense of depth and relief to the cards. The set name, player name and team logo are embellished on the card front with gold foil. The card backs are photo-less and contain moderate career highlights. 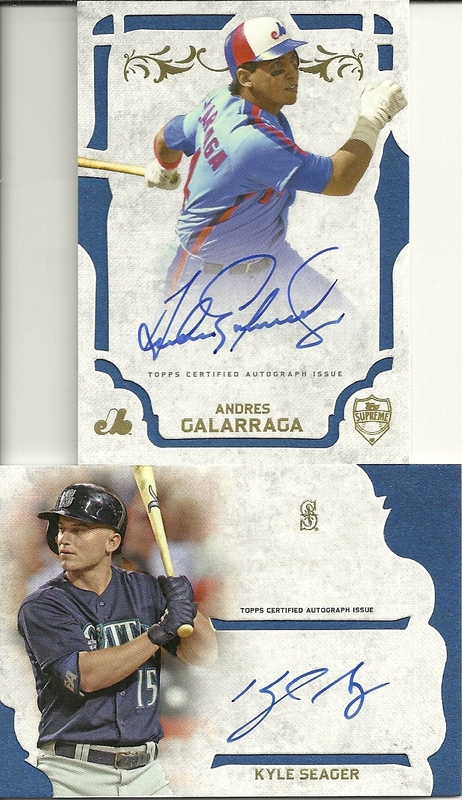 2015 Topps Supreme returns as a very popular high-end product. This is the epitome of a lottery ticket though with just the two cards per box. The autographs are on-card. I do like the inclusion of retired stars and current players. There are several different serial numbered tiers and color variations to chase. For being fairly well protected in the box, the cut-out seem prone to dinging, especially where the cut-out design meets the actual card edge. I can not give my usual out-of-five rating for Topps Supreme as there are only two cards per box. It would be unfair to rate the whole product for set building, overall design, collation and subjects included (Rookies vs current vs retired stars) based on such a small sample size. I will give 2015 Topps Supreme a shop around rating though. Most collectors will be further ahead if they just buy the singles they want. If you do buy a box, trade you Tigers and Rickey Henderson cards to me!